Volunteering – Your key to a world of professional opportunities! Volunteer for the 2019 OVATION Awards! We have a variety of volunteer opportunities available and welcome applicants with varying interests, knowledge, experience, and availability. Please see below to view our current available roles. who won the awards but more importantly what made their entry stand out. Monthly meetings starting in January. Large time commitment in April, May and June. Email toronto-volunteers@iabc.com referencing “Materials Co-Director” in the subject line. reference the volunteer position you are interested in. If you like meeting new people, then this role is for you. We need volunteers to assist at the registration desk during the gala event. You’ll be helping with set-up, greeting guests, handing out badges, giving directions and answering questions. We all know from the Oscar’s how important it is to get the winners right. In order to make sure that the right winners are picking up the right trophies, this role is critical. Your responsibilities will include managing the trophies/awards onsite, arranging them in order of presentation, and ensuring they get into the hands of the right winners. Email toronto-volunteers@iabc.com referencing “Awards Management (day of Gala)” in the subject line. Please include your resume. Help us determine who the fan favourite is for this year’s OVATION Awards. You’ll be responsible for polling IABC/Toronto chapter members and non-members to cast their votes for the People’s Choice Award - the most popular award of the evening. Enjoy knowing who the winner is before everyone else! Email toronto-volunteers@iabc.com referencing “People’s Choice Coordinators” in the subject line. Please include your resume. From books to movies to music, everyone has an opinion. For this year’s event, we’d like to introduce a new interactive activity to engage attendees on their views of the latest communications issues, trends, tips or challenges. Working with the Materials Co-Directors, you’ll help organize and conduct a live polling activity at the event including choosing the polling device, coming up with the questions and finding fun ways to present the feedback. Learn something new and have fun doing it! Email toronto-volunteers@iabc.com referencing “Audience Polling Coordinators” in the subject line. Please include your resume. Do you enjoy playing games at events? Then this role is for you. Help us introduce a fun ice breaker during the reception that will get attendees talking, meeting and networking with new people. Working with the Events Director, you’ll assist in creating and executing an ice breaker activity during the event. Email toronto-volunteers@iabc.com referencing “Networking Coordinators” in the subject line. Please include your resume. Unsure of what volunteer role best suits you? 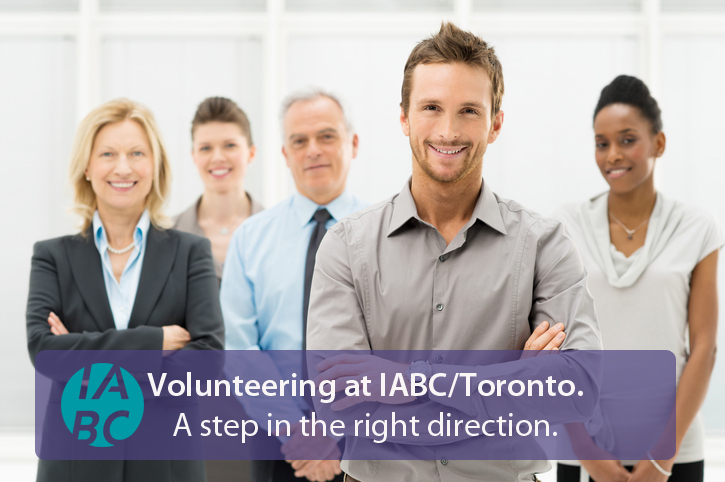 Whatever your ability to contribute in terms of time and effort, volunteering with IABC/Toronto can help you expand your professional network, gain valuable skills, and build your work experience! Please note that you need to be a chapter member in order to volunteer with IABC/Toronto. What are the goals you would like to achieve through your volunteering? Is it to increase your network? To gain experience? To showcase or acquire skills? To give back to the community? All these are great reasons to volunteer! Be realistic about the time you can put aside to fulfil your volunteer assignment. This is all the more important if you are thinking of taking up a director-level role—a volunteer position that lasts for an entire board year and it directly links with some of the chapter’s key initiatives. The table below outlines what each of IABC/Toronto’s portfolios does, the kind of commitment it calls for, and the main programs and roles it is associated with. We suggest you shortlist three portfolios you would like to work with and keep that in mind as you move on to Step 3. Head over to the volunteer form and apply. If you have questions, you are welcome to contact the VP, Volunteer Services. Remember: We will be offering more volunteer positions as the Board year progresses, so watch our social media channels and our bi-weekly e-Lert newsletter for announcements. Also keep in mind that many of the below-mentioned roles will progressively fill up as the Board year advances. What is this portfolio about? This portfolio looks after the recruitment, retainment, and recognition of all IABC/Toronto’s volunteers. It also operates the annual Mentorship Program. The portfolio is very member-facing and will present you with plentiful opportunities to expand your network. Meet the Board (September): An event open to members and non-members to meet the new Board, network, and learn about volunteer opportunities. Mentorship Program (October to April): A key chapter initiative that matches senior members with junior communicators. Mentor of the Year: An award that recognizes a mentor who has made a huge difference in the professional life of a mentee. Volunteer Recognition Event (June): An event to thank all our volunteers. Director, Volunteers: Help the VP recruit and manage the chapter's volunteers, and enrich their experience. Director, Mentorship Program (Implementation) Each director works with the VP to reimagine and implement the annual Mentorship Program, and manage the award-process for Mentor of the Year. This portfolio oversees IABC/Toronto’s online branding and presence. Work with the VP to develop and implement the chapter’s social media strategy. The portfolio also publishes Communicator, our bi-monthly digital magazine. Director, Social Media: The Director, Social Media helps manage IABC/Toronto’s social media presence. The Director’s responsibilities include creating a social media content and live-tweeting/ livestreaming the chapter’s events, including the OVATION Awards. Digital Analyst: Reporting to the portfolio VP, the Digital Analyst conducts a review of IABC/Toronto's digital assets, including the toronto.iabc.com website, social media accounts and Communicator e-magazine. Following their review, the Digital Analyst will produce a report with recommendations for the chapter to improve digital usability and accessibility. Editor-in-Chief of Communicator: If you enjoy and have experience developing and implementing editorial calendars, liaising with contributors, and managing editorial processes, this role may be ideal for you. Membership is a strategic portfolio that actively attracts and engages our chapter’s members, ensuring they fully leverage the benefits of their membership and gathers their feedback. This portfolio works closely with two other portfolios: Communications & Digital Media and Students and New Communicators. Director, Membership: Support the VP to engage the chapter’s members, promote the benefits of membership and gather feedback. The portfolio creates meaningful networking opportunities for members and non-members. Volunteering for this portfolio will present you with opportunities to manage and lead social events throughout the year, and build your own network in the process. Director, Netoworking:Working with the VP, plan and manage various networking events including event budgets, venue selection, promotion and marketing. Co-directors will have the opportunity to lead the planning of one event over the year. This portfolio supports the OVATION Awards, the chapter’s flagship event that recognizes the best communications talent in the GTA. Volunteer positions usually get listed here in October. The OVATION Awards Gala, held every May. Director, Events: Works with the VP to organize various elements of the Awards Gala. Director, Awards: Works with the VP to ensure delivery of the awards (i.e. trophies, certificates, plaques). Materials, Co-Director: The two co-directors work with the VP to produce key event materials that will tell a great story about the award winners. Using visuals and content from the winning submissions, you’ll produce material that not only shows who won the awards, but more importantly, what made their entry stand out. Other roles such as greeters, polling, networking, trophy presenters will also be available and shall be announced closer to the event date. A chance to get creative as you help the VP conceptualize, organize and promote various professional development opportunities that help members advance their knowledge and skills. The portfolio organizes various initiatives throughout the year that focus on professional development for all communicators, members and non-members, from students to senior professionals. Director, Professional Development: Helping the VP to organize and manage professional development events as well as post analysis of events to apply to future events. The OVATION Awards program, where you will help the VP recruit, recognize and guide senior communicators in their role as judges. Facilitate the Communicator of the Year award. In collaboration with IABC HQ, promote and deliver certification exams (CMP, SCMP) in the GTA. OVATION Awards program (May): The OVATION Awards are held annually, and recognize the best and brightest of communications talent in the GTA. Communicator of the Year: Work with the VP to facilitate the recognition of the GTA’s most effective communicator. Key roles will be announced soon. This portfolio creates and maintains critical partnerships for the effective working of the chapter’s programs and activities. If you enjoy identifying, soliciting and liaising with sponsor organizations, this portfolio may be ideal for you. Director, Advertising and CareerLine: Support the VP to attract advertisements across our channels, generate revenue through the sale of advertising in chapter publications (i.e. ; CareerLine, e-Lert, Communicator e-magazine, etc. ), and identify ways to attract businesses to post jobs on CareerLine. Director, Partnerships: Seek out potential sponsors and opportunities to partner with standing events/organizations; ensure IABC/Toronto sponsors are recognized appropriately; maintain documentation for all partnership and sponsorship programs. This portfolio focuses on serving the unique needs of members who are students and those new to the profession in the GTA. Student of the Year: Each year, IABC/Toronto recognizes a student member who exhibits leadership, passion, creativity and excellence in communications. Agency Fair: An event targeted at students and young professionals who wish to know how a PR agency works. An opportunity to meet agency insiders from diverse industries. Date and location TBD. This portfolio focuses on creating opportunities for the professional development, networking and networking needs of specialized groups of communicators within IABC/Toronto. The portfolio runs the chapters Professional Independent Communicators (PIC) group, which holds regular evening events that alternate between seminars and socials. The portfolio may also hold networking events for niche communicators. Assisting with planning and executing professional development and networking events.